Bay Cove Inn - Jeffreys Bay Accommodation. Bay Cove Inn is a cosy, clean and budget type accommodation establishment in Jeffrey's bay. 150m walk to Albatross beach on the corner of Da Gama (Main road) and Poplar Street. Our establishment portrays a nautical theme with "masts and sails" on deck. Definitely not five star accommodation, but clean and great value for money and very well known to overseas tourists. We have 10 en-suite cabin/rooms made up of 2, 3, 4 and a 5 sleepers. Each cabin/room has TV including selected satellite channels with coffee and tea making facilities. Cabins can be accessed via a separate side security gate entrance. No air-con but fans and electronic safe in all rooms. Rooms are serviced daily with linen and bath towels supplied. A dining cabin where breakfast is served upon request, Our establishment is not apartments and self catering is in the form of a communal kitchen. Each room is allocated a lock-up unit in this communal kitchen with everything supplied for a self catering stay. We have a large swimming pool in a fenced garden. Ample braai/barbeque facilities. Parking is off-street under carports and secure parking inside premises for 5 vehicles/trailers. 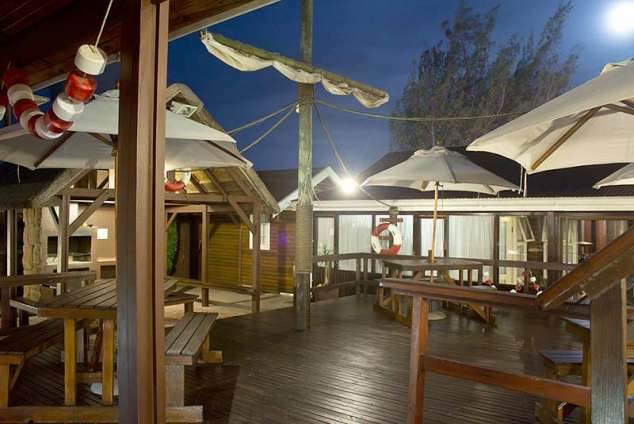 Cosy wooden deck to enjoy your braai/barbeque - stars at night, umbrellas during the day. Tsitsikamma forest, Stormsriver, Baviaans kloof and many more. Jeffreys bay is known for Super tubes beach, where annual international surfing contest is held, approx. 1000m from Bay Cove Inn. There are excellent steak and seafood restaurants, and shopping centres no further than 3km from Bay Cove Inn. We take pride in our attitude towards cleanliness, respect for our guests and an honest good value for money establishment - "Friends leave as closer friends". 29276 page views since 27 Jul, 2005.